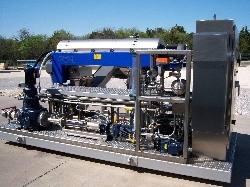 Progressive cavity pumps are utilized throughout Clearwater's systems. The narrow footprint, low shear, positive displacement, provides exceptional performance in the de-watering and manufacturing industries. Clearwater utilizes various types of grinders, macerators and hydrocyclones to reduce particle size, grit and trash in the slurry feed systems depending on process requirements. Grinders are used for applications where rocks, wood and other hard trash is in the slurry requiring particle size reduction. Macerators are utilized when fiber length reduction is required to reduce the "balling" effect causing imbalance in the centrifuge.